For this book review I read Baby-Led Weaning: The Essential Guide to Introducing Solid Foods-and Helping Your Baby to Grow Up a Happy and Confident Eater by Tracey Murkett and Gill Rapley, The Experiment LLC, copyright 2010, Kindle Edition. It is referred to as "the book" on Baby-Led Weaning (BLW). BLW is a method of introducing solid foods by offering a selection of finger foods and allowing the baby to decided how, what, and whether to eat. The caregiver does not spoon-feed purees to the baby. The term "weaning" is used in the British sense, to mean the introduction of solid foods, rather than in the America sense of decreasing milk feedings. As soon as I heard of the concept of BLW, I was excited to give it a try. I had a general understanding of the concept- that we would let our baby grab food from our plates and munch away. About a week before our son was to turn 6-months-old I joined a Facebook group about Baby Led Weaning. Someone in the group mentioned that before starting BLW it is best to know the difference between gagging and choking. The comment made me realized that I better read more about BLW before diving in. I purchased the Kindle edition of Gill Rapley's Baby Led Weaning book on Amazon for $8 and started reading right away. Baby-Led Weaning follows the baby's lead in deciding when it is time to introduce solid foods. As soon as I heard about BLW I was hooked! This was the method I was going to use to start solid foods with my exclusively breastfed baby (it works for formula-fed babies too). I was convinced that pureed baby foods are unnecessary. They were invented at a time when formula was becoming more popular than breastfeeding, but the formula was so lacking in nutrition that babies were started on processed cereals and pureed foods at six weeks old. Clearly, those babies were too young to be eating actual solid foods. If we wait to introduce solids until the baby can feed himself or herself, goopy mushes are unnecessary. I first read about BLW in The Womanly Art of Breastfeeding . However, the overly-simplified summary of BLW was a bit misleading. It made the various eating skills sound like they were all prerequisites to be met before starting any solids. I was expecting that my baby would need to be able to: (1) sit up, (2) grab food from my plate, (3) aim food into mouth (4) no longer have the tongue thrust reflex (5) chew, (6) swallow, and (7) use the pincer grasp to pick up small pieces before beginning solids. However, once I read Baby Led Weaning: Introducing Solid Foods, I realized that some of these eating skills are acquired over time, once the baby is already practicing with solid foods. The pincer Grasp- using thumb and forefinger to pick up small objects (around 8-months-old). Also, the gag reflex gradually moves farther back on the tongue over a few months time. Waiting until at least 6 months of age to introduce solid foods is ideal, since by that age most babies are showing the outward signs of readiness, plus their insides are mature enough to handle solids. Breast milk and formula are more nutritionally dense than solid foods and provide for healthy growth. Food allergies are less likely to develop, since the gut and immune systems are more developed. Digestive enzymes are present, to extract nutrition from the solid foods. The baby likely has the skills to feed himself or herself. Gill Rapley's book goes into more detail as to how to proceed with baby-led weaning, but here is the basic idea. Provide a safe place for Baby to eat. 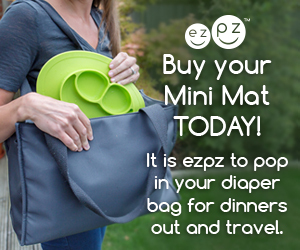 Allow Baby to join you at the table and engage in the social setting of meal-time. Allow Baby to sit upright either in your lap or in a high chair. Allow Baby to work it out on his or her own if she is only gagging or coughing. Know what to do if Baby is actually choking. Offer a variety of nutritious solid foods. Avoid offering choking hazards, foods containing high levels of salt or sugar, and foods to which family members are allergic. Continue milk feedings on demand. Breast milk or formula remains the primary source of nutrition for the first few months, until Baby is digesting a significant amount of solid food. Clean up the mess after the meal is over. It is about exploring TASTES and TEXTURES. Take as much time as needed. Eat as little or as much food as desired. Yes, the book is a bit repetitive in stressing that Baby should feed himself, instead of the carer putting food in Baby's mouth or dictating how much to eat. I think the repetition is well-founded, since many parents are reluctant to give up control of the meal and allow Baby to find their own way. Apparently, during an average week, Baby will choose a well-balanced assortment of foods and their food intake will balance out, even if some meals are skipped. Babies can self-feed from around 6 months of age, so there is no reason to do it for them. This sounds like my mother's approach to parenting: "Don't do anything for them that they can do themselves". I was proud to be dressing myself, fixing my hair, and packing my own lunch when I was in Kindergarten. TRUST your baby to choose what or whether to eat and to learn how to eat by following your example. Meal-time will be a pleasant learning experience when Baby is given control over their dining experience. You still get to choose which foods to feed your family, and offer a selection of healthy options from the family meal to your Baby. You do not need to prepare any special "baby" or "kid" food. The BLW journey is likely to culminate with a child who is willing to try many types of food, has a positive attitude regarding food, and knows to stop eating when full. The most important reason to read this guide to BLW is the safety information, but the tips on how to prepare for the mess are also helpful. The Baby-Led Weaning book would be even better if it cited more studies regarding the way babies develop eating skills when using the BLW approach versus traditional weaning. You can help support Natural Beauty Lifestyle by purchasing through my affiliate link. There will be no extra cost to you, and I will earn a small commission. Thank you for your support. You can purchase Baby-Led Weaning: The Essential Guide to Introducing Solid Foods-and Helping Your Baby to Grow Up a Happy and Confident Eater on Amazon. If you are wondering what meals to prepare for your family that your baby can enjoy, there is also The Baby-Led Weaning Cookbook: 130 Easy, Nutritious Recipes That Will Help Your Baby Learn to Eat (and Love!) a Variety of Solid Foods-and That the Whole Family Will Enjoy . How are you introducing solid foods? If you have older children, are you trying something different this time?